Learn how to allow assistants to schedule meetings in Zoom on behalf of someone else. You can assign a Pro user or multiple Pro users with UCSD Single Sign-On (SSO) credentials to schedule meetings on your behalf. You can also schedule meetings on behalf of a user (or multiple users) that has assigned you scheduling privilege. Users with scheduling privilege on your account will be able to manage and act as an alternative host for all meetings. 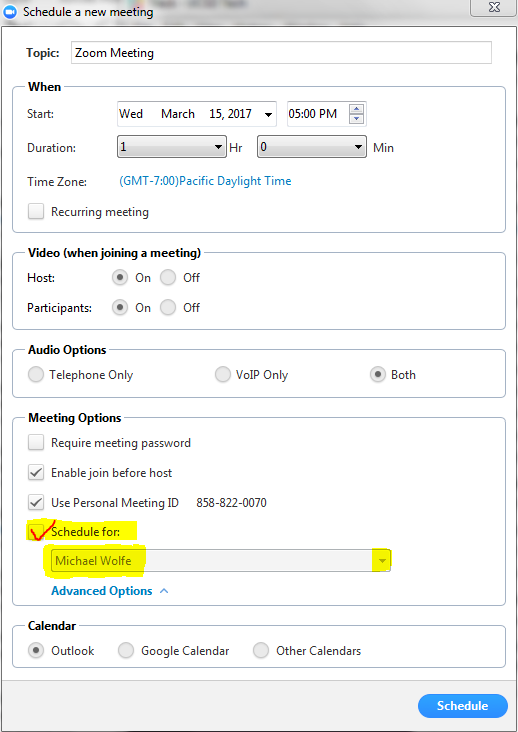 Go to your My Meeting Settings and click Add under Scheduling Privilege (near the bottom). Type in the email address of the assigned scheduler(s). Use commas to separate multiple email addresses. Questions? Email us at zoom@ucsd.edu.